Led by U.S. Secretary of State John Kerry, foreign ministers from 11 countries meeting in Doha cited the presence of foreign fighters in Syria and the use of chemical weapons by Damascus in agreeing Saturday to increase arms shipments to the rebels. The ministers said in a joint statement they would "provide urgently all the necessary materiel and equipment to the opposition on the ground, each country in its own way in order to enable them to counter brutal attacks by the regime and its allies and protect the Syrian people." 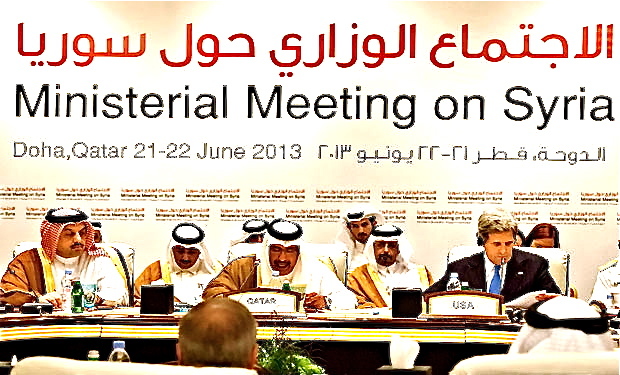 The Prime Minister and the Minister of Foreign Affairs of Qatar and the Foreign Ministers of Saudi Arabia, the United Arab Emirates, Jordan, Egypt, Turkey, the United Kingdom, Germany, France, Italy, and the United States, met after Rome, Istanbul and Amman in Doha on 22 June 2013 to discuss developments in Syria. After the peace initiative announced by Foreign Minister Lavrov and Secretary Kerry, Bashar al-Assad, Iran and Hezbollah launched military operations against the people of Syria. The Ministers expressed their concern about this offensive calculated to change the situation on the ground to the determent of the peace initiative. The Ministers expressed their concern about the growing sectarian nature of the conflict in Syria, and the radicalizing risks that accompany such developments to regional and international stability and security. In this regard, the Ministers condemn the intervention of Hezbollah militias and fighters from Iran and Iraq in Syria, who are aiding Syrian regime repression against the Syrian people in locales like Qusayr, Aleppo and Ghouta and other parts of Syrian territory. These actions threaten the unity of Syria, broaden the conflict across the border threatening further militarization that undermines the Geneva initiative and inflame the entire region. The Ministers demand that these fighters leave Syria immediately and called on Hezbollah and the government of Iran to immediately effect such a withdrawal and to take steps to stop sectarian tensions. The crossing of fighters and militias, who support the regime and are involved in military activities and operations in the Syrian territory, must be prevented. To pursue all appropriate avenues in the UN to support and protect the Syrian people. The Ministers reaffirm their strong concern over the increasing presence and growing radicalism of the conflict and terrorist elements in Syria -- a matter that deepens the concerns for the future of Syria, threatens the security of neighboring countries and risks destabilizing the wider region and the world.